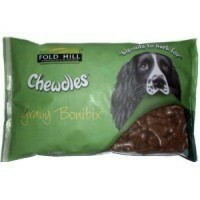 Foldhill Chewdles Bonibix Gravy Bone Dog Biscuits are a wholesome, nutritious, bone shaped treats. Made using the finest ingredients, these mouth-watering biscuits are coated in rich gravy and oven baked to perfection. Packed with vitamins and minerals, they are the perfect complement to a well-balanced diet. Their special crunchy texture is also great for exercising teeth and gums and keeping teeth free of the build-up or tartar.